This 2-song promo tape is like a foretaste to the band’s new mini-CD which will be called Gemini. I don’t know why they didn’t just send some selfmade CDs, considering the low price of CD-Rs these days. This way we get a really crappy sound quality, and it’s hard to judge the music. What I could discern through the tape hissing sounded like a good combination of melodic death and gothic metal, with some cool guitar solos and interesting keyboard work, that’s both atmospheric and virtuosic (is that a word?). There’s not much more I know to say about it, except that you might have a look at the band’s homepage where you can download some sound snippets, but also only in low bitrates. Again we can ask the question why not offer one or two songs entirely and in good quality, especially in times where there are services like MP3.com where you get as much disk space for free as you want? 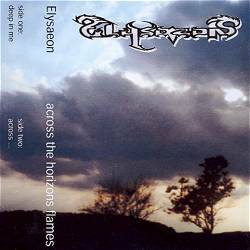 I am not giving this promo-tape a rating, which wouldn’t be fair considering the circumstances, but I can imagine that people who like original death metal with lots of ideas should give Elysaeon a chance.